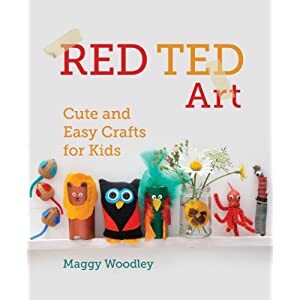 Today the Red Ted Art blog tour stops at Baby Budgeting and we are thrilled to host an interview with Maggy Woodley the author is of this fabulous craft book which is publised tomorrow! So Maggy, your first book Red Ted Art Cute and easy crafts for kids is published tomorrow . Congratulations. Tired! Ha. But I write this at the end of a super long day with tired children!!! But very happy otherwise!! The book turned out so beautiful and I am super happy with it. And the kids and I seem to be crafting more than ever at the moment, which is wonderful. Can you tell us about the book? In essence, the book shares 60 crafts for kids – loosely between the ages of 4-14yrs. Yes, that is quite a broad age range, but I see this as a book where you sit down and craft WITH Your children. Younger ones will need more help, older ones can go off and their own and do the projects themselves or sit down with you and create something together. 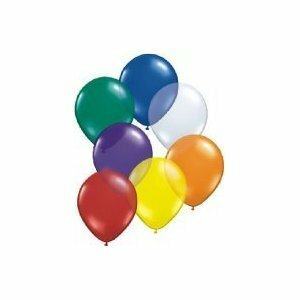 The aim of the crafts are to be fun, inexpensive and easy to do – with the odd challenging one to keep you on your toes. Most of our crafts are made with every day household items and things I hoard from the recycling – old tissue paper and ribbons etc. Generally speaking you only need to buy glue and googly eyes and you are well on your way to some gorgeous crafts! It sounds fantastic ! What prompted you to write it? It came off the back of my blog www.redtedart.com which I started 3 yrs ago as “something to do” a creative outlet and a creative “motivator”. Having the blog as got me crafting regularly for myself and with the kids. Did you craft as a child? Yes, I had an “adoptive” grandmother who did a lot of crafting with me and who taught me the basics of knitting and sewing. I have fond memories of working with her. Later as a teenager I continued to love crafting and did so on whatever occasion presented itself. I guess my adoptive grandmother nurtured a love for crafting, as well as give me the skills to do so. When I was 13 I had a best friend who also loved to craft. So we encouraged each other. Later on in life inspiration would come from the “need” to want to make small gifts for friends and family. Why do you think crafting is a good thing for kids to do? ation. But you are also developing their fine motor skills and their confidence. For me crafting is also associated with a lot of happy memories and that in itself is a good reason to craft! Some people prefer their kids to craft at playgroup, nursery or school as they perceive crafting as messy and expensive . What do you think about this and do you have any advice? Crafting does not have to be either messy or expensive. Let me start with expensive – we certainly do not spend a lot of money on craft materials (considering how much we do craft) – upcycle old candles, old clothes, wrapping paper, loo rolls, go looking for sticks, stones and shells etc. These form the basis of many of our crafts. And our crafts also make great gifts – so you could say that you are saving money as you encourage the kids not to buy, but to make. As to messy – it is what you make of it and which crafts you choose – e.g. we have some painted pet rock monsters (messy) and we have some pet rock animals were we used felt and googly eyes (not messy). It depends on the activity! I craft with my son’s class on occasion and I can tell you that the crafts I do there are no where as enticing as the crafts in Red Ted Art the book (well a handful are). I have to simplify the majority of crafts for a group environment, which means that the kids get a different result. And if it makes you feel better – some days I cannot bear the mess either and when the kids beg to get the paints out, I give them a clear “no”. Do it occasionally when you feel up to it! What do your children think of your book? They love it – they each have their own and are quite territorial over it. I think they are pleased to see photos of themselves in it! I would like to thank you Maggy you have personally inspired me to be more crafty with my family. We like making BIG pictures and cartoons and painting stones. What are your most favourite crafts to do in your family? Awe thank you Becky! I am so chuffed that I have already managed to inspire you! Makes me happy! And I know how well your son can draw. So that is fantastic to encourage it more. As to my favourite crafts – argh – I really can’t say. It varies from week to week. But I do love “seasonal crafts” – especially Easter and Christmas, as to me they contribute to that “special” atmosphere that the different celebrations bring with them. Last but not least how are you going to celebrate your book launch? Ah. Now there is a good question. Thankfully we have already toasted it with a glass of bubbly… but I really must get myself organised and have a little party SOON! Thank you Maggy and we’ll be thinking of you tomorrow! Thanks for all your support Becky and for having me on your blog today!!! Much appreciated and SOOOO exciting! Have pinned and shared on G+! What a lovely interview. We’ve just bought the book, which my 8 year old is thrilled about, so we’re all ready to get crafting!